Pictured is a scene from the inaugural Escape Room, held at the library in November 2017. Shown, from left, are Mariah Young, Payton McFarland, Abby Taylor, and Adrianna Stewart. MASON — Finding your way through the Mason Public Library is easy, but will prove to be a more difficult feat when an Escape Room event is held July 27-29. According to Teresa Gibbs, organizer and library clerk, the Escape Room will be based on the fantasy novel, “A Wrinkle In Time,” written by Madeleine L’Engle. It is free and open to the public. Time slots will be 6, 7, 8, and 9 p.m. on Friday, Saturday, and Sunday. The Escape Room is for adults and children, but Gibbs said children under 13 years must have at least one adult in their group. The challenge, upon entering the library, is to solve various clues and puzzles that will unlock interior doors, ultimately leading back outside. Those completing the challenge in 45 minutes or less will be deemed successful in escaping. Anyone wishing to participate must register by calling the library at 304-773-5580. Only a limited number of participants will be scheduled for each time slot, Gibbs said. This is the second Escape Room held at the Mason library. Gibbs said the first one, held in November 2017, was so successful, employees decided to do another. She said the dates of the upcoming event were chosen to be before the Mason County Fair and the start of the school year. The reason for the Escape Room is two-fold, according to Gibbs. The first is purely for the enjoyment and entertainment of the participants. The second is to allow those taking part to become more familiar with the library and what it has to offer. Gibbs added the clues to move people toward the escape might take them to the reference section, the movie shelves, or the non-fiction book area. The escape room will also incorporate the Virgil A. Lewis Reading Park, which is next door to the library. Participants are asked to arrive at the park 15 minutes prior to their scheduled Escape Room time to go over rules. The time will also allow them to visit the park and read the plaques about the historic figure. Gibbs hinted that some of the clues leading to the escape might even be based on Lewis. Although the escape room is free, refreshments of hot dogs, treats, and drinks will be sold in the park before and after each time slot. A third escape room is being planned at Christmas time. 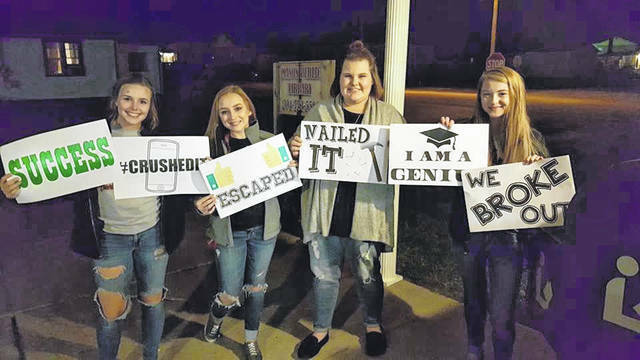 https://www.mydailysentinel.com/wp-content/uploads/sites/14/2018/07/web1_0720.EscapeRoom.jpgPictured is a scene from the inaugural Escape Room, held at the library in November 2017. Shown, from left, are Mariah Young, Payton McFarland, Abby Taylor, and Adrianna Stewart.